Work straight from the browser! 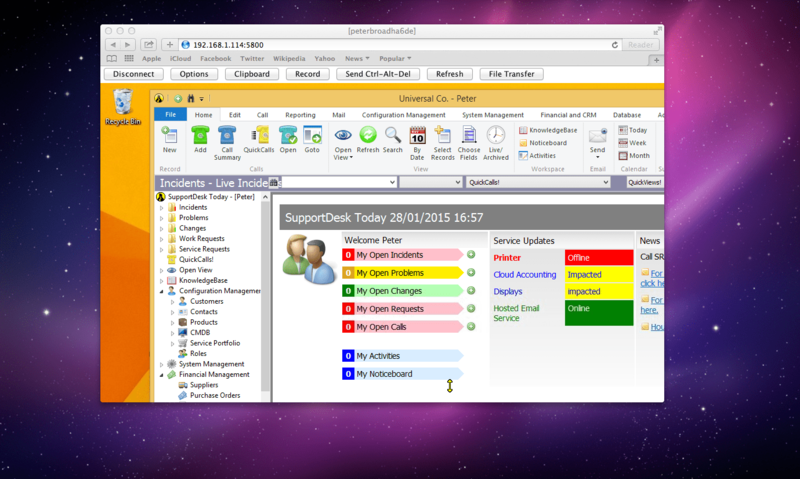 Remote Desktop Support: SupportDesk integrates with UltraVNC, Dameware Remote Support, or Remote Desktop Connection to allow various Remote Control capabilities. These can be utilised in modern browsers and within Windows to improve the efficiency at which technicians can solve tickets. This leads to increased productivity, speedier helpdesk ticket resolution and heightened customer satisfaction. Initiate and control remote screen sharing sessions from modern internet browsers. Let your end users join a remote support session at the click of a button. Transfer files quickly and securely across networks. Customers and support agents can speak directly to one another through an instant messaging format. Work to resolve helpdesk tickets quickly and simply by viewing issues remotely.